This brown blob in Pembrey forest was almost stepped on. There were just two fb's a yard or so apart. A look at the spores confirmed this was Gyromitra ancilis. 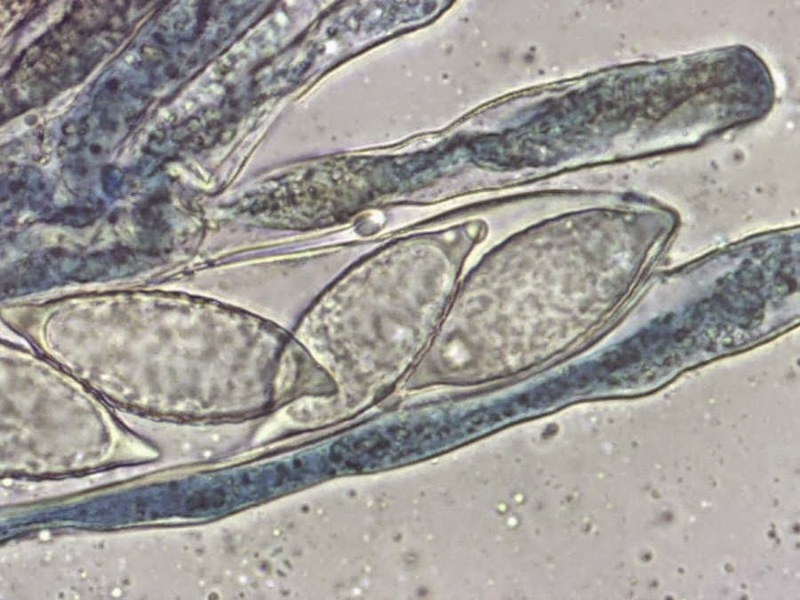 The micro-photo of spores was taken by David Harries (Pembs) and shows the pointed appendages at each end of the spore. The group on the left were found last February about 800m from the present find but none have been seen at this spot so far this year. There were about 40 fb's. One specimen was sent to Kew as this is an uncommon species. David took the microphoto last year. Most records are from Scotland although there are several records from east Anglia and a couple from Radnorshire. 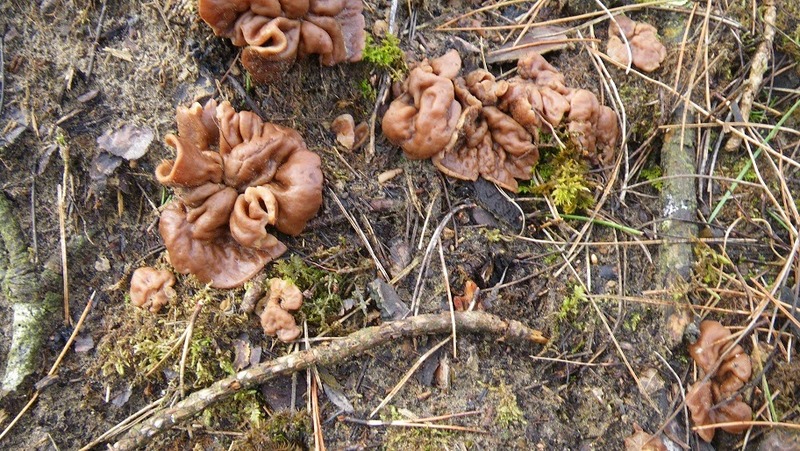 The generic name should probably be Discina but FRDBI and CATE list them under Gyromitra. 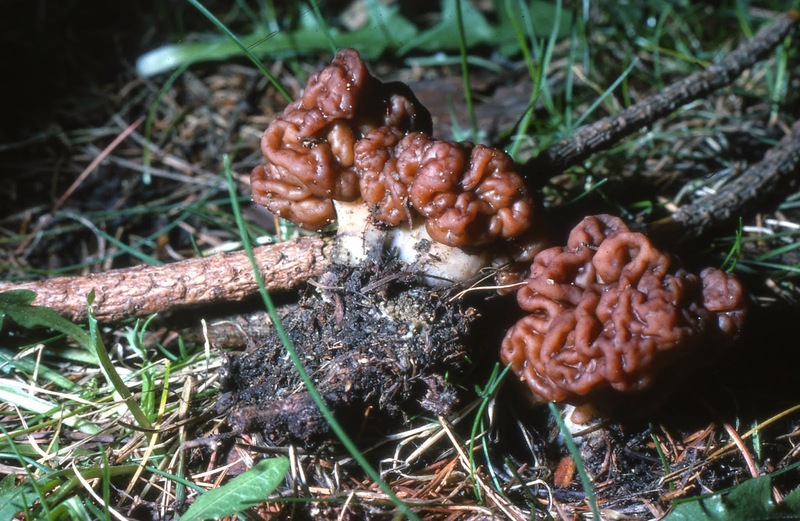 This is Gyromitra esculenta the False Morel from Swiss Valley reservoir in 1973. This was present at this site for about five years. This has convolutions like brain tissue and another name is Brain Gyromitra. The stipe with this species is obvious but with G.ancilis it is short and remains hidden in the soil. G.esculenta is poisonous although it was once sold in Scandinavian markets when it was thought the poisonous properties were removed by boiling and throwing away the liquid. Co-incidentally Phillip, somebody on the BMS Facebook page has just posted up that he's seen Gyromitra esculenta with Scot's pine Pinus sylvestris in Warwickshire today. Says it's a good year for them.